Marshy ground, muddy shores, roadside ditches. Wet woods and swamps. All of the continental US except FL and a few western states. Herbaceous perennial to 1.3 m. Stems smooth, 4-winged or angled. Leaves opposite, sessile, lanceolate to oblanceolate, acuminate, somewhat toothed, to 10 cm below and reduced upwards. 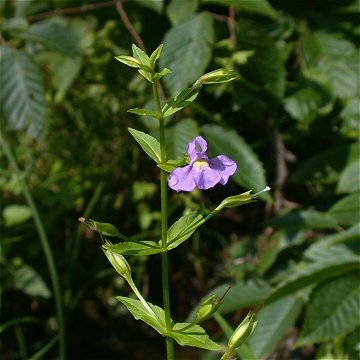 Flowers solitary from upper lead axils; pedicels to 4.5 cm and longer than the calyx; calyx green or purple-tinged, 4-angled, the lobes sharply pointed; corolla blue to purple with 2 yellow ridges obscuring the throat, bilabiate; stamens 4. Fruit cylindric. A variety of this species, Mimulus ringens L. var. colpophilus Fern., occurs on tidal flats in ME. This genus is well represented in western North America.